(Bloomberg Opinion) -- Bang & Olufsen S/A is convinced that people want to buy its $15,000 televisions. The problem is that retailers don’t seem to agree. The Danish maker of high-end electronics warned on Tuesday that earnings and revenue will decline this year, abandoning three-year targets that were cut only two months ago. The shares fell by about a quarter. Bang & Olufsen Chief Executive Officer Henrik Clausen is adamant that the demand is there. Consumers bought 6 percent more B&O TV sets in the three months through February, he said. But rather than restocking to replace those sales, retailers have instead used the opportunity to pare their inventory, and cut purchases by 25 percent. Clausen attributed the drop-off to concerns about price competition from retailers who don’t have B&O’s stamp of approval but nonetheless offer its products, often at a discount. This unauthorized selling ultimately happens either when an approved retailer sells its inventory to a third party (which can then sell it on to consumers), or if B&O withholds approval because of discounting. Neither would be possible if the shops felt consumers wanted to buy the goods at the full price. Add in skittishness from a slowing Chinese economy and deteriorating consumer confidence in Europe, and sellers’ justifiable wariness about the products looks set to continue. Clausen had gambled that new distribution networks would uncover new customers, and counter these forces. The forecasts for this push were too optimistic, and the approach has failed. Chief Financial Officer Anders Aakaer Jensen, whose department is responsible for setting the sales estimates, left in November. The arrival of his successor might remedy some of the shortcomings with the projections, but that won’t happen until later this year. As a super-luxury brand, the most optimistic might expect B&O to be immune to the competitive pressures of the mass market. 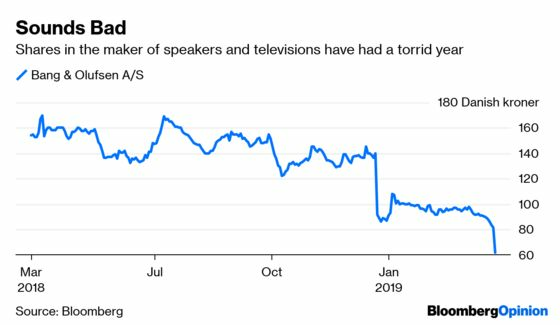 But Apple Inc., Amazon.com Inc. and Alphabet Inc. all now offer high quality smart speakers far more cheaply than does the Danish firm. 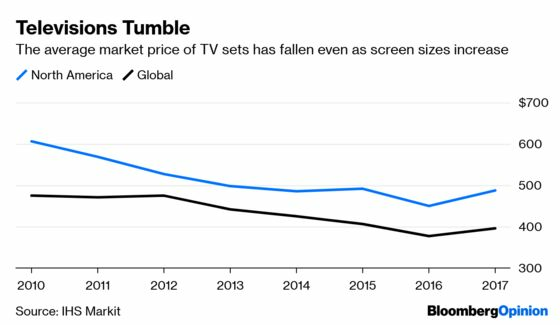 And Samsung Electronics Co. Ltd. and LG Electronics Co. Ltd are now able to sell smart televisions for a lower upfront cost, with the expectation that they’ll make a better return over time from the recurring revenue generated by advertising and other services. That’s accelerated the trend of sets becoming bigger and cheaper every year. That competition has made life harder for B&O, which tries to differentiate itself through design and sound quality. The firm still has healthy cash reserves and low debt. But capital expenditures increased in the third fiscal quarter as it invested in new products, dragging free cash flow further into negative territory. Far from the turnaround promised by the CEO, the situation is deteriorating. The show is far from over, but more than positive noises, investors need to see positive results from Clausen.